Plants with firm, knotty, shortly rhizomatous bases. Culms 60-180 cm. Sheaths keeled, mostly glabrous, collars pubescent; ligules to 0.5 mm, membranous, ciliate; blades 3-10 mm wide, glabrous or sparsely hispid, apices attenuate and involute. Panicles 15-40 cm long, 3-5 cm wide, erect or nodding; branches 10-15(25) cm, strongly divergent to drooping, stiff or lax, lower branches naked for 1/3-1/2 of their length; pedicels 3-8 mm. Spikelets 5-10 mm long, with 4-8 florets. Lower glumes 2.5-3 mm, often mucronate; upper glumes 3.5-4 mm; lemmas 3-5 mm, lateral veins puberulent or ciliate to well above midlength, midveins and lateral veins usually excurrent, midveins extending to 0.5 mm, lateral vein extensions shorter; paleas as long as the lemmas, widened below; anthers 1-1.5 mm. Caryopses 1.8-2 mm. 2n = 40. Perennial knotty-based herb with short rhizomes 0.6 - 2.2 m tall Leaves: with open sheaths that are shorter than the internodes, longitudinally folded, and usually hairless but hairy at the collars. The membranous ligules reach 0.5 mm long and have margin lined with hairs. Blades 6 - 25 cm long, 3 - 10 mm wide, gradually tapering to the tip, hairless or sparsely bristly-haired, with margins that are flat or rolling toward the upper surface of the midvein (involute). Inflorescence: terminal, branched (panicle), rising above the upper leaves, 15 - 40 cm long, 3 - 5 cm wide, erect or nodding, with divergent or drooping branches 10 - 25 cm long. 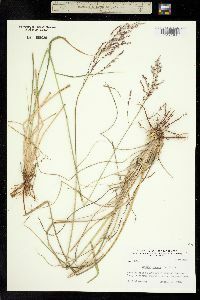 The lower branches lack spikelets for one-third to one-half of the length. Fruit: a dark brown caryopsis, 1.8 - 2 mm long, kidney-shaped in cross section. Culm: 0.6 - 1.8 m long, erect and more or less hairless. 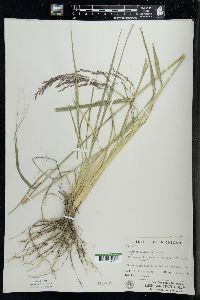 Spikelets: 5 - 10 mm long, laterally compressed, borne on a stalk to 3 - 8 mm long. Glumes: unequal, with the lower glume 2.5 - 3 mm long and usually ending in a short abrupt tip, and the upper glume 3.5 - 4 mm long. Florets: four to eight per spikelet, with three reddish purple anthers 1 - 1.5 mm long. Lemma: 3 - 5 mm long, with hairy midveins and lateral veins extending past the end of the lemma (excurrent). Palea: as long as the lemma, widening at the base. Habitat and ecology: Introduced from the southern United States, this species is common along mowed ditches, sandy roadsides, and sandy fields. Etymology: Tridens means three-toothed. Flavus means yellow.